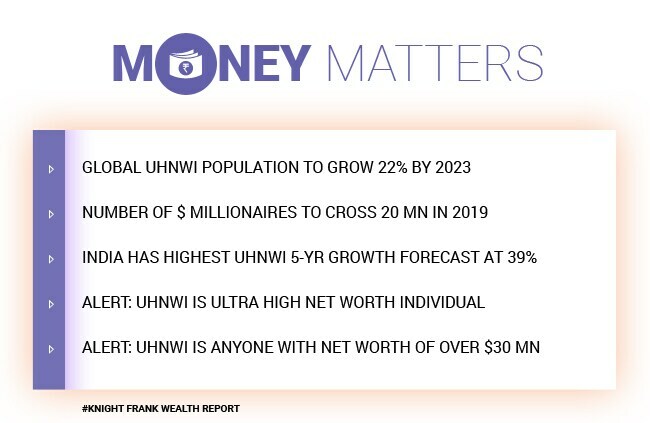 The number of global US dollar millionaires will cross 20 million this year, despite challenging economic climates in many developed and emerging economies. That’s the word coming in from property consultant Knight Frank, who released its 'Global Wealth Report' earlier on Wednesday. While the number of individuals with a net worth of more than $30 million will go up by 22 percent in the world over the next 5 years, India is likely to outperform, with a forecast of 39 percent over the same time period. London, New York and Hong Kong retained their top 3 positions as hubs of wealth creation, Singapore and Los Angeles round off the top 5. 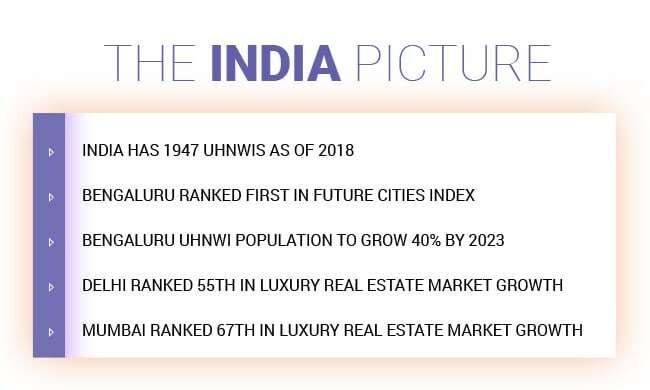 Bengaluru has clinched the top spot on the list of future wealth hubs and its ultra-high net worth population is expected to grow by 40 percent by 2023. So where are these rich people investing their money? The answer may not surprise you. 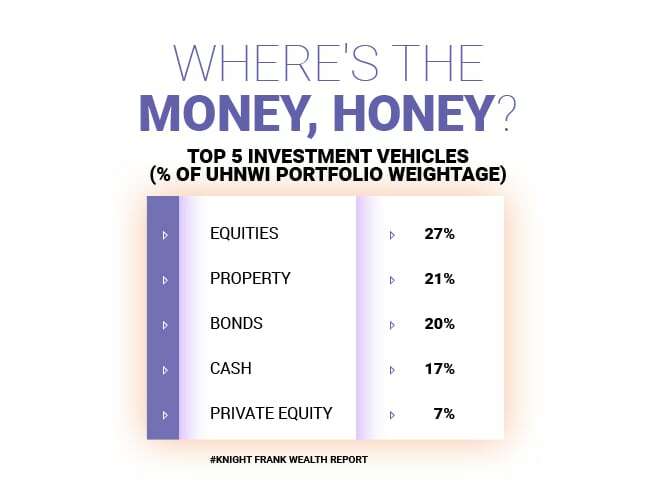 According to the report, equities remained the most popular choice for investments, with a global average of 27 percent of UHNWIs portfolios being geared towards them. Property came in second with 21 percent, with bonds close behind at 20 percent. The more interesting list encapsulated the highest change in asset value over the last 12 months. Rare whiskey topped that list with 40 percent growth, and India’s annual Scotch whiskey consumption was higher by 40 percent as well. 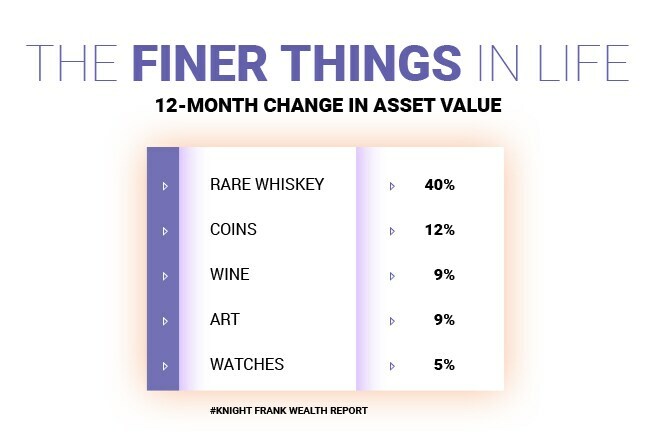 Rare coins saw an average appreciation of 12 percent, and wine and fine art rounded off that list with a 9 percent growth. 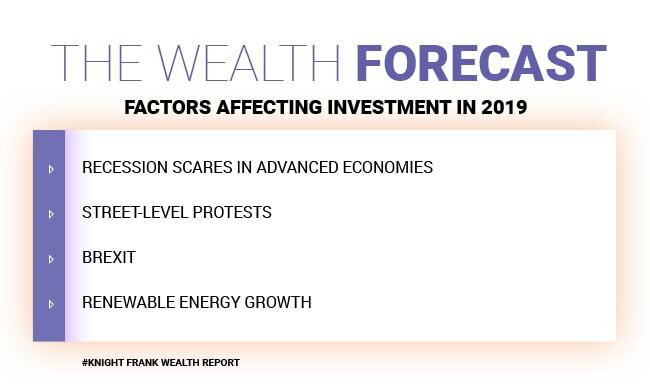 Knight Frank also provided a list of factors likely to determine where the money will flow in 2019, the top factor being a potential recession in the global economy, which has been stable since the last global financial crisis in 2008. Leaderless populism is second on that list, with the rise of street-level protests like the yellow-vest protests in France. Brexit will also affect the course of UHNWI investments this year. On the positive side, the consultant expects that investors will have a newfound appreciation for blockchain technology and its potential uses this year. And if all else fails, at least they’ll have stocked up on some fine whiskey to numb the pain.